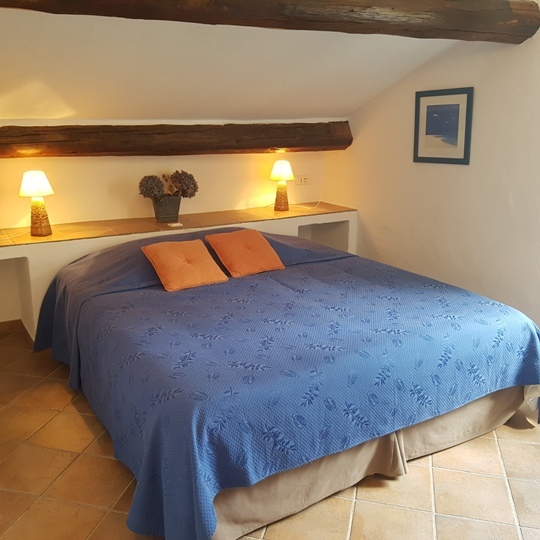 Moulin de la Roque, Noves, Holiday villa, Cigales, 10 pers. 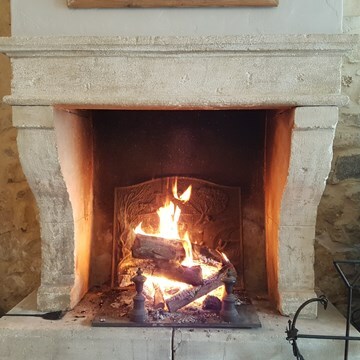 Les Cigales, a five bedroom guest house located on the historic estate and ancient flour mill of Moulin de la Roque, is ideally situated to visit Provence. 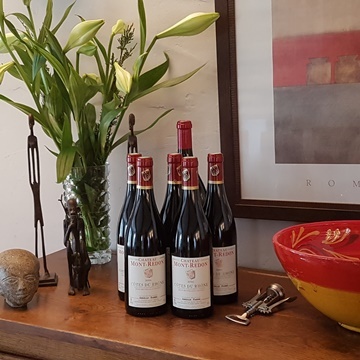 It is only 800 meters from the charming traditional village of Noves, 15 mintues from Saint-Remy-de-Provence, 20 minutes from Avignon and the TGV station, 45 minutes from Marseille airport, 20 minutes from the Luberon. 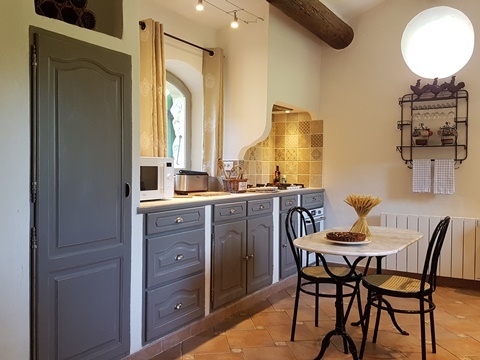 This charming Provencal villa is large enough to accommodate 10 people very comfortably. This makes it perfect for your group or family as it has a large living area, dining area, and kitchen. Families with children love this villa due to its size, flexibity and the large lawn just in front where their children can play safely close by. Couples and adults will enjoy the privacy of each bedroom and bath. As an extra convenience, any bedroom can be either 2 single beds or 1 large king (1m80 x 2m). Restored from an early 19th century stone barn, Les Cigales was originally used to store wheat for the mill. You will enjoy its panoramic views on the southern garden and the sounds of the gently flowing river just behind. Entering Les Cigales from the southern garden, you will find a spacious stone terrace covered with Wysteria and Jasmin. Teak table, chairs and lounge chairs will entice you to waste away hours here. There is also a built-in stone barbecue. 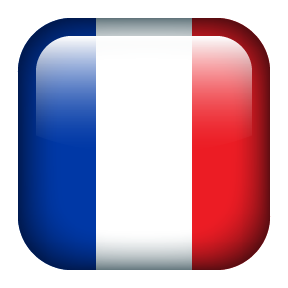 Behind a large set of French doors, is your living area with comfortable seating for all, a flat screen television and an old large stone fireplace typical of France and this area. 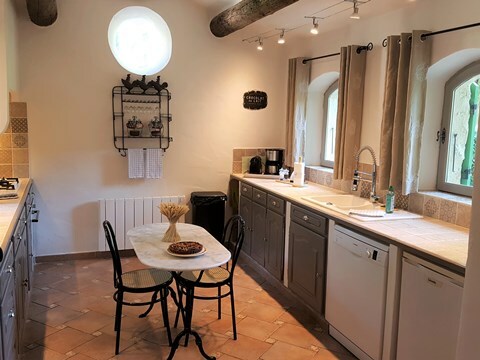 This spacious living area is open to both a large dining area (seating for up to 14) and just around the corner, a typical Provencal kitchen - fully equipped with everything you may need for your stay, including two refrigerators, convection oven, microwave, five burner gas cooktop, coffee and hot water maker and Nespresso machine. 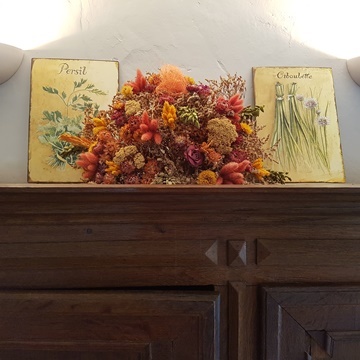 On the ground floor, there is a wing just off your dining area which includes three air conditioned bedrooms, all decorated with typical Provencal fabrics and nice antiques. Each bedroom includes a bath (shower or bath/shower) and for extra convenience, there are separate hidden vanity sinks. On the second floor, you will find two additional large air conditioned bedrooms (each with vanity sinks), one full bath and shower, and a separate toilet room. 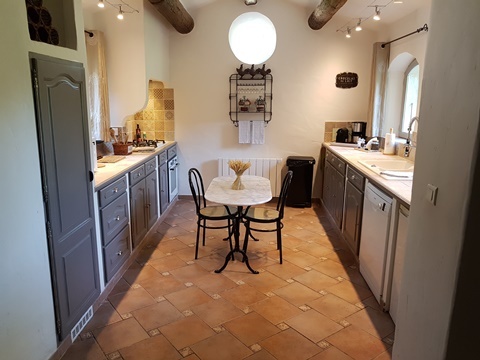 For larger groups,Les Cigales, le Mas des Oliviers and the salle inbetween can be combined to create a very comfortable 8 bedroom (all air conditioned ), 7 bath villa (La Bastide Cezanne - 325 square meters, 3,500 square feet.) Plenty of space for your entire family and friends! Terrace covered by a Wysteria and Jasmine vine- covered frame. Open large Provencal kitchen with gas cook top, convection oven, microwave, dishwasher, two refrigerators, and other essential appliances. Full of sunlight, windows with view of the southern garden. Bedroom 1 : Spacious, King bed 1m80 x 2m (can be 2 single beds upon request, as any other room), hidden vanity sink, cheerful provencal decor and fabric, air conditioning. Bedroom 3 : Bedroom with private entrance to center courtyard. King size or single beds, vanity sink, air conditioning. separate bath with shower bench and toilet. Bedroom 4 : Large and colorful blue provencal fabric, king or single beds with private hidden vanity sink, air conditioning. Bedroom 5 : King or single beds and hidden private vanity sink. Bright, cheerful and plenty of space, air conditioning. Shared bath (tub/shower) with adjacent bedroom. Up to 2 Babies under 2 years old are not included in the capacity.